An exchange-traded fund is a fund or security which is used to track the prices of the underlying assets. These can be “traditional” assets such as gold or oil, just as well as other commodities, bonds, equities and even cryptocurrencies, such as Bitcoin. With an ETF, it is possible to establish custody over the assets which are tracked, followed by the issuance of shares which confirm the ownership over such assets. Exchange-traded funds behave in the manner similar to traditional stocks, at least in the sense that they can be traded on regular stock exchanges. Their rise in popularity owes much to their perceived selling and buying potential, as well as solid liquidity they offer. For an investor intending to purchase the underlying asset of an ETF, they often represent a more accessible option compared to trading the assets themselves. This level of trading convenience extends to Bitcoin as well, which was what recommended this cryptocurrency for an ETF model in the first place. How Does a Bitcoin ETF Work? As there are some misunderstandings regarding the ETF’s true potential, it is generally advisable to learn as much about their management and creation before investing in them. ETFs should be approved by the regulatory body in charge of the securities’ market prior to being made available on the stock exchanges. Despite the push to get ETFs based on Bitcoin approved in the US and Europe, the regulators have since shot down more than a dozen attempts to approve these. The stated reasons for this have to do with concerns about price manipulations and the security of the underlying cryptocurrency asset. The first rejection took place back in 2013 when the Winklevoss brothers attempted to launch their Bitcoin Trust. Despite this, the optimists hope to see the first Bitcoin ETFs approved in either 2019 or 2020. Once the ETFs get to the exchanges, they can be bought and sold, and the decisions made in this regard can bring either profit or losses for the investor. The ETFs also come with the management fees which are covered by decreasing the net asset value (NAV) of the ETF. Since ETFs behave like traded stocks, their price may fluctuate during the trading day based on the existing supply and demand. 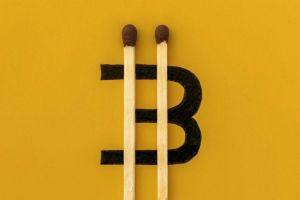 What Could Be the Advantages of the Bitcoin ETFs? Bitcoin and other cryptocurrencies would receive much-needed exposure and validation from the global financial markets. Bitcoin ETFs are seen as an easier way to raise awareness about the growth of blockchain technology, without forcing the investors to get involved with potentially risky token sales or complex blockchain-based projects. Since the ETFs are traded on exchanges as stocks for a long time now, they have already gained substantial popularity among both institutional and retail investors. ETFs are a well-established security type and are often seen as offering stable liquidity and being easy to buy, sell or short sell. The hopes of the proponents of Bitcoin ETFs are not limited to professional investors only: going the route of ETFs should mean being able to sidetrack exchanges, making the buying and selling of Bitcoins a bit easier for an average user as well. The investors would not have to bother themselves with cryptocurrency exchanges since they can simply buy and sell the ETF with the help of “traditional” exchanges. Bitcoin ETFs arguably represents a more flexible option for short-term, medium-term or long-term investments, unlike the Bitcoin futures which are often described as more suitable for short-term endeavors. Better regulated status of Bitcoin ETFs should help with legalizing the status of the Bitcoin as an asset as well. Combined with potential tax advantages, less space for market manipulations and less volatile trading, the ETFs are seen as potential stabilizers of the Bitcoin as a project. Those more optimistic among the supporters of the Bitcoin ETFs see them as a way to restore Bitcoin’s price and reputation to what it had in the times before its ongoing crisis. The investors’ hopes are set on the potential of Bitcoin ETFs to redirect the flow of funds into Bitcoin’s global market. This is particularly important for the funds coming from institutional investors such as banks or hedge funds. Once their money is injected in the ETFs, the price of Bitcoin should follow suit and become more stable. 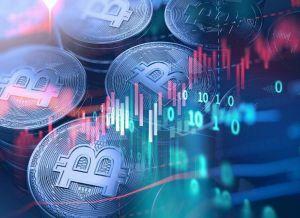 Finally, Bitcoin ETFs may also benefit institutional investors such as mutual funds and pension funds, as they can expand their portfolios with cryptocurrency exposure in a more regulated manner. ETFs would make it easier for investors to invest in cryptos and engage in speculations with its prices without bothering with the technical issues, such as coin storage, creation of wallets, security procedures, etc. .
Bitcoin ETFs should give investors access to the services of regular brokers. In addition to feeling safer with their investments in this manner, the investors would not have to deal with security-related issues such as hacking attacks, thefts, and others. The ETFs would be insured against these risks, and the custodians can be obliged to stick only to transparent sources of data relating to the transactions with Bitcoin. All of these efforts should arguably foster confidence among both the investors and the crypto market players. The ETFs are seen as the instruments for attracting money from investors who are familiar with the ETF format, but know much less about the Bitcoin technology and are unwilling to start learning about it. Since Bitcoin ETFs behave like investment vehicles, the investors would be able to short sell their ETF shares if they decide that Bitcoin prices are going to take another nosedive. This is not an option in the standard cryptocurrency markets. What Are Potential Weaknesses of the Bitcoin ETF Model? The issue of ETF custody and regulatory oversight is a crucial obstacle to wider adoption of the Bitcoin ETF model. Regulatory bodies, such as the SEC, hesitate to approve ETFs since they want them to be backed by physical bitcoins stored by authorized institutions or third parties. This is hardly possible since bitcoins are not a physical commodity (like gold or oil). Financial institutions which want to do business in the crypto sphere will have to decide whether they want to develop and implement their own storage and custody solutions or use the ones offered by the established players in the crypto world. Another issue is the fact that trading in bitcoin futures still lags behind that done with mature assets such as oil or gold. Lower trading volumes make it more difficult for the ETF to get official approval from the regulatory authorities. Custodial system use by ETFs may put off the users who want more control over their bitcoins instead of handing it over to a custodian. With bitcoins being controlled by a third party, no matter how “trusted” it is, the investors would have little or no say in deciding on the future development of the governance and consensus mechanisms in Bitcoin protocol itself. The SEC, for example, also quoted potential risks of frauds and manipulations as one of the main reasons for refusing to approve several Bitcoin ETF applications. This body also referred to the applicants’ inability to stop or prevent fraudulent practices to which the investors may be exposed. In line with this, ETFs may also be seen as stimulating the adoption of Bitcoin for the purpose of speculation, instead of it being used as genuine currency. There are even some fears that, instead of ETFs driving Bitcoin’s price down, this model would actually cause Bitcoin price spikes. Removal of a larger amount of Bitcoin from circulation may make the first global cryptocurrency even scarcer as an asset and destabilize it. Bitcoin ETFs should not be confused with blockchain ETFs, despite their superficial similarity. For starters, the difference between the two mirrors the one between Bitcoin as a cryptocurrency and blockchain as its underlying technology. Blockchain ETFs are used to track the prices of companies that invest in blockchain as technology, particularly in case of businesses that utilize it as a transformative technology. In this case, blockchain is treated as a tech solution and, as such, it is not relatable to a particular product or a business sector. ETNs are structured products that are issued as senior debt notes. Unlike them, ETFs represent a stake in an underlying commodity. ETNs behave in the manner which is more similar to bonds, in the sense that they are unsecured. Unlike them, ETFs provide investments into a fund that holds the assets it tracks, such as stocks, bonds or gold. ETNs have a less rocky reputation with regulators in terms of their legal status - the Bitcoin ETN, for example, has been trading on the Swedish stock exchange since 2015, and it is offered in euros and kronas as Sweden’s native currency. ETPs represent a type of security that is priced derivatively and trades intraday on a national securities exchange. 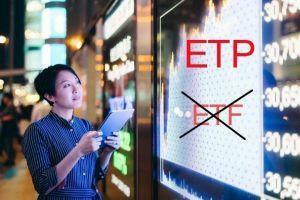 ETPs are passive investments, which sets it apart from ETFs. Yet, investment tools such as commodities, currencies, share prices, or interest rates can be parts of an ETP. These funds can operate like actively managed funds, including ETFs. Crypto ETPs already exist in the market (Grayscale Investment’s Bitcoin Investment Trust, for example).